I also went to panels – a lot of panels! – and took notes. I’ll be putting those up over the course of the week. I could not be happier with my decision to go, and I’m now 98% sure that I’ll follow it up by attending GaymerX East next month (NYC, November 12 & 13). More info on that later. With that said, guess who had a spectacular technical failure? I was presenting Saturday on a topic dear to my heart – modern interactive fiction tools for beginning game devs – and giving a rapid overview of Twine, ChoiceScript, Ren’Py, and Inform 7. I wanted to show the differences between how the systems are used from both practical and stylistic standpoints, so I wrote the intro to a small game and then executed it in all four systems…. …and the projector didn’t work with my new laptop. Which caused a graphics driver crash. Fun times! And because so much of it depended on installed programs, scouting for an emergency laptop just wouldn’t have sufficed. The show must go on, so I winged it, but I promised to put all my materials online afterward. Here goes. ChoiceScript: Open these files with a text editor (I personally like Notepad++). Ren’Py: Open the script file with a text editor. If you would like to compile it instead, download Ren’Py, create a new project, and copy all of these files into the game folder of the new project. Inform 7: Open the file with a text editor. If you would like to compile it instead, download Inform 7, create a new project, and copy all text from the file into the source view. This isn’t directly related to my talk, but if you want to play an extraordinarily gay (but rated E for everyone!) 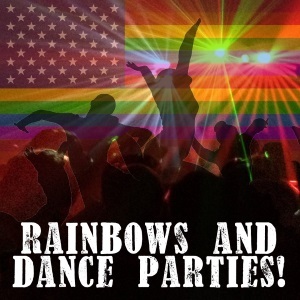 parser game, I created “Rainbows and Dance Parties” to celebrate Obergefell v. Hodges. Expect exactly what you see on the cover.